Go Away, Mr Worrythoughts! is a ‘must turn to’ resource for those children who suffer from anxiety. Using her personal experiences, Nicky Johnston calls on superpowers and the visualisation of Mr Worrythoughts to encourage control and confidence in children. Testaments abound as to how useful, practical and life changing this children’s book has been for many parents and their children suffering from the often crippling effects of anxiety. Bayden, the main character, is based on Nicky’s own son who learns to recognise and use the superpowers which lie within him. The picture book follows Bayden as he acknowledges the effects that Mr Worrythoughts has on his every day life. Bayden reaches in to the super hero inside and orders him to “Go Away”. Bayden’s facial expressions change and soften as he watches “Mr Worrythoughts slowly melt into a mound of slime and sludge” – a great image for children to hold on to. The success of Go Away, Mr Worrythoughts! lies in its language and illustrations which reach out to children on the right level. Where this picture book becomes such a practical, usable resource is in its honesty … Bayden knows that Mr Worrythoughts “tries very hard to sneak back”, this is an important acknowledgement for those involved in this fight, however Bayden now knows he has “found his superpowers” and he CAN make the thoughts disappear. The book concludes with three practical steps, accompanied by useful illustrations, to help control the anxiety and to empower children. 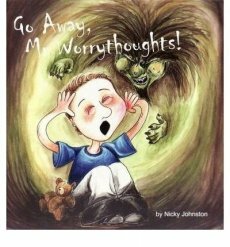 “Go Away, Mr Worrythoughts!” has now been adapted into a professional theatrical production which is touring primary schools (prep – Grade 6) in Victoria. This fabulous production is produced by Frankston Arts Centre, who have shown amazing initiative to educate children through the Arts! See the trailer below. I highly recommend you also consider Nicky’s Happythoughts are Everywhere too.